Sebastian Izzard is an art dealer, art consultant, author, curator, and appraiser based in New York City. In addition to having sold $190,000,000 worth of Japanese and Korean art, many items of which went to major museums around the world, Dr. Izzard has organized 21 gallery exhibitions of Japanese and Korean art in New York. He shares his insights on the Japanese arts market. What is your top piece of advice to someone new to collecting? Sebastian Izzard: Go with your heart, not your head, and buy the best quality that you can afford. In my experience, I have found that I have always done well when I have purchased something I responded to emotionally rather than those pieces which I bought for purely financial reasons. I’ve always found that I have done well on those items that I had to stretch for. What is the biggest surprise you’ve had in regard to the value of Japanese pieces? Dr. Izzard: Generally, I’ve been surprised that the value of Japanese art has been so stable over the last 20-odd years. In the 1980s prices rose very quickly, however, prices today have been very stable even as the market in other areas has fluctuated dramatically. Given the rise in other areas of Asian art, Japanese art now looks quite reasonable by comparison, a fact that astute collectors are taking full advantage of. What region or era of Japanese art do you think will garner attention in the near future? Dr. Izzard: It’s impossible to predict the future; if we could, we would all be wealthy. But there are areas where the market is plentiful and opportunities exist. Edo period paintings, prints and ceramics are all areas where good quality may be obtained at a reasonable price. Early 20th century art is now coming into vogue and is already becoming a major area that is likely to grow in the future. What advice do you give to people hoping to sell an item from their collection? Dr. Izzard: Establish a value by consulting either a private dealer or the auction houses—or preferably both—and then make a decision based on the best advice given. Which piece of Japanese art was your favorite this past year? Dr. Izzard: My favorite piece was a historically important painting by Miyagawa Choshun (1683–1753) depicting a performing Ryukyuan musical troupe. 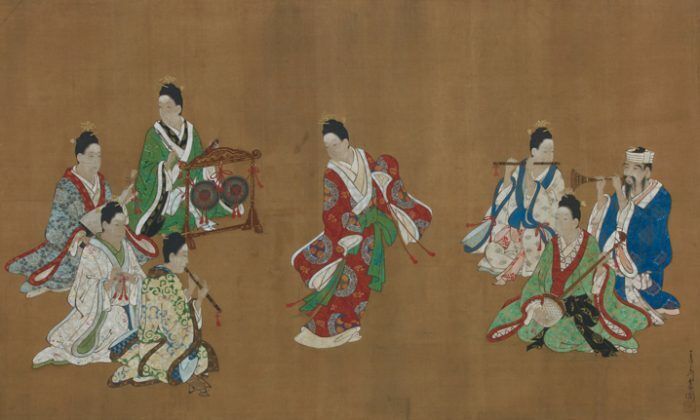 Once in the Baron Kawasaki Collection, this painting possibly records musicians who accompanied a delegation from the Ryukyuan Islands to Edo in 1718. It is always exciting to be able to link paintings with actual historical events, and this gave me the added pleasure of discovery—which is one of the great, overlooked aspects of collecting—when I began to research the painting after I purchased it.